In an interview with Goethe.de, Ben Gibson, director of the German Film and Television Academy in Berlin, explained that cooperation was immensely important to him. In February 2017 he will have been in office for a year. Reason enough to look both back and forward. Mr. Gibson, in September 2016, and in your first year in office, the German Film and Television Academy in Berlin (DFFB) celebrated its 50th anniversary. What was the first DFFB movie you saw? I was a film distributor in the UK in the 1980s, and there were not many people interested in German films. Some German directors like Wolfgang Petersen, who was one of the first DFFB alumni, was already working in Hollywood. I was specialising in documentary and experimental films. I acquired the rights to a couple of Harun Farocki movies, and Kluge’s Die Patriotin. We were all very interested in the Filmverlag der Autoren group – Rainer Werner Fassbinder, Wim Wenders and other directors from the New German Cinema. Later I followed the work of directors like Christian Petzold, Angela Schanelec and Thomas Arslan, who belong to the so called Berliner Schule, and Woldgang Becker. But I haven’t thought about it as specifically DFFB or Munich film school work – I was looking for exciting new German films to buy for the UK. R.W. Fassbinder, who became one of the most famous German directors, applied to the DFFB in it’s very first year, in 1966. He was rejected. What measures do you make use of when looking for new talent? Of course he should have got in! He was rejected twice, I think. One problem with film schools is the tendency to take students who seem to be full of cultural potential, but not good at developing, sharing and collaborating. I’m interested in students who have the courage to fail, to share and to learn how to think with other people and through other people. Cooperation is hugely important to me. We always try to say our project, not my film. It is of course still individual work, but work which has come about through a collaborative process. Political involvement is important for me, an understanding of the world, and the energy to do a lot of hard work. German Film and Television Academy Berlin | Photo (detail): © German Film and Television Academy Berlin When you look back at the DFFB, it’s a turbulent history. Students took to the streets in 1968. You can say that the ideology was to use the camera as a weapon during the student riots. 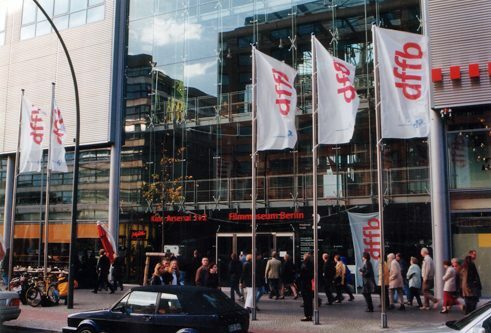 Due to the special situation of Berlin, the DFFB was and still is the most political of German film schools. Will you continue in this tradition? Absolutely. I can’t think of any time in history that was more important in terms of what cinema means in the world than our political and social situation now. But I think making films that really relate to our experience is a complicated project. This leads me to the idea that we have to make films politically and not so much to make political films. We have to remember that all content is political – even when you make a film about having breakfast with your girlfriend, you are involved in the politics of everyday life. Today anybody can watch CNN and the BBC and think they know what the world is about, but I think it’s harder now than it was 20 years ago to feel a sense of solidarity with other people across the world. There’s a tendency in a rich country to think – I’m just a middle class spectator, but those people in the refugee camp are really living life and politics. I watch them through a zoom lens from a distance and try to create empathy and understanding. And then sometimes the only thing you feel is the exoticism of that relationship. A mature approach to filmmaking, however, means taking responsibility for how I, as a filmmaker, understand politics and society. In February 2017 you will have been director at the DFFB for one year – what are your visions for the future? We’re trying to build an institution that permanently questions itself and its structure and its ideology. Sometimes it frightens me when staff or students talk about “traditions”, as I’m interested in non-tradition traditions. But everyone here has taken the school into their hearts, and they take responsibility for what the school actually represents. I want us to work together on building up even more film craft excellence, on things like organising follow-up programs after students graduate – paying more attention to the next steps the students take, for example, with projects related to networking, sales marketing, distribution, co-productions with eastern and central Europe, in collaboration with other schools and festivals there. It is also the task of the DFFB to use its great flexibility to remind everyone that a film school and its people can be a catalyst that has an influence on the whole culture of filmmaking. Since February 2016 the producer Ben Gibson (born 1958 in London) has been director of the DFFB in Berlin. From 2001 until 2014 he headed the London Film School. He is also the founder of the London-based Metro Cinema Group and he has worked as a producer at the British Film Institute (BFI). Anke Leweke is a film journalist for print, radio and TV.